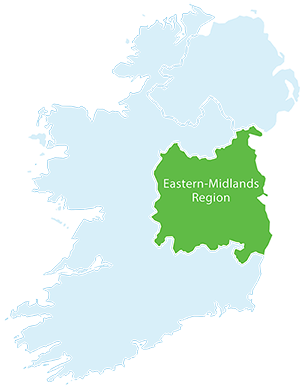 The Eastern-Midlands Waste Region (EMWR) in one of Ireland’s three waste management regions. The EMWR spans an area equal to one fifth the total area of the country and serves approximately half the national population, over 2.2 million people. The urban/rural population split in 81%/19%, however in some local authority areas within the region there are more rural than urban residents (eg. Laois, Longford, Offaly and Westmeath). The framework for the prevention and management of waste, in order to prevent pollution, protect health and conserve resources, is set out in the Waste Management Plan, a statutory document underpinned by national and EU waste legislation. The responsibility for implementing the Plan in this region is the Eastern-Midlands Waste Regional Office (EMWRO) and the region’s constituent local authorities. The EMWRO is situated in Dublin City Council, the lead authority for the region.